Does Society Need Law Enforcement? If So, What Is It Worth? What do our communities expect from their officers, and at what cost? Would you work as a police officer for minimum wage? Not long ago, officials in Scranton, PA, seemed to think some people would. Back in 2012, in an effort to save the budget and keep the city's finances afloat, Scranton Mayor Chris Doherty reduced all city workers' salaries to minimum wage, including law enforcement and other public safety employees. It should not surprise you to know that this wasn't the first attempt to minimize police wages around the country, nor will it be the last. In the midst of budget savings measures, departments across the country have slashed wages, reduced or eliminated overtime programs, changed retirement plans and reduced benefits packages. All of these moves, while perhaps seemingly necessary in the short term, may have unintended long-term consequences. Do We Need Law Enforcement? Such measures beg a question which at some point communities are going to have to answer: do we need police and if so, what is law enforcement worth to us? If communities feel it's important to have a professional, well-educated and highly-trained police force, then they will need to get okay with the fact that it will cost money for equipment, competitive salaries, and benefits. Unless they're just looking for unarmed security guards to patrol their streets, the minimum wage isn't going to cut it. Our current concept of policing recognizes the importance of balancing the need to protect people with the need to protect and preserve individual rights. While the specific functions of law enforcement may evolve, the role remains the same, and no less necessary now than ever before. The concept of policing in America is relatively new. In fact, the history of the modern police force is barely 150 years old. However, communities have always understood the importance of policing themselves in some manner, and thus the early history of policing goes back thousands of years. Some measure of law enforcement has always been required to keep the peace, maintain order and provide for free movement and furtherance of commerce. That need is only amplified in today's ever-advancing society. Almost universally, it is now accepted that police forces are a necessary component of any modern society. For communities across the country, tough choices and tough questions lie ahead. In law enforcement and other criminology and criminal justice careers, as with most things, you pay for what you get. A day in the life of a police officer can be draining, both physically and mentally. If you want to attract the best and brightest, you have to pay wages that the best and brightest will accept. If you want to pay minimum wage, well, you'll probably have to significantly lower your expectations of who you'll be able to hire and retain. Across the nation and around the world, societies are (rightly) demanding better-educated officers who can think critically and use intelligence, discretion, and communication first. Any use of control is nearly instantly criticized and critiqued in favor of peaceful resolutions over demonstrations of force. 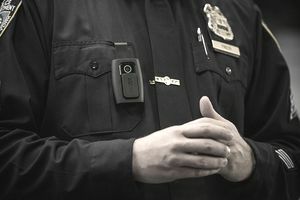 The level of scrutiny officers are held to is only increasing as technological advances, such as body-worn cameras, change the way police do business. Unfortunately, the demand for professional-level policing is not often coupled with professional-level wages. This leads to a disconnect between what society expects and what it is willing to pay to get what it needs. The need for law enforcement will not subside, and so departments must continue to hire officers to fill growing vacancies. The inability or unwillingness to pay the price to attract smarter, more compassionate and professional officers will continue to increase the divide between what communities want from their police departments and what those departments are able to deliver. What do you think about the move to pay police officers minimum wage? What are your thoughts on law enforcement salary and benefits? Are they too lavish, or too low?